This painting by Lucas Cranach, a contemporary and friend Luther and his family, shows clearly our calling to preach Christ and Him crucified, pointing to the Lord,not to ourselves. The papal theologians had been teaching and preaching for too long: Christ, yes, faith in Him, yes, but Christ plus something else: works, both God’s Law and man-made religious rules. God’s Law show us our sin so He can show us our Savior. The Gospel, the Lord’s one work of universal (catholic) salvation in the life, death, resurrection and ascension of Jesus Christ means that the whole papal system of rosaries, pilgrimages, indulgences can not save one, they can not atone for Jesus Christ for all the world did atone: He is our Mediator (from “Salvation Unto Us has Come”, TLH, #377). Christ alone has, by grace alone known by Scripture alone in the life of His Church. The Law of God can not save (see Galatians 2:19, Galatians 2:21, Ephesians 2:6-8 ). The Reformers presented on this day their Confession, based soundly upon the Scripture and the 3 Ecumenical Creeds (Apostles, Nicene and Athansasian), that salvation in Jesus Christ is sheer gift for sinners who can not attain heaven by anything we can ever do. We celebrate October 31, 1517, when then monk Martin Luther posted the 95 Theses on the church door in Wittenberg as the beginning of the Reformation, but it is actually today is the beginning of the Reformation when Melancthon and the blessed Reformers set forth the restoration of the true Doctrine of Justification in plain words in the Augsburg Confession. 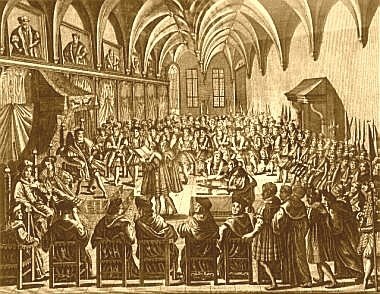 The Fathers at Augsburg began this Confession of the catholic Church with the Creeds to demonstrate that Justification is the key of Scripture and had been taught and preached and administered since the Apostles through all the ensuing centuries, but lost and forgotten by the papal church. This lively iconographic image shows Word and Sacraments, the Preaching of Christ and Him crucified, freely given rein for the joy and edifying of Christ’s holy people for their faith and faith active in love. The papal theologians had been teaching and preaching for too long: Christ, yes, faith in Him, yes, but Christ plus something else: works. The Gospel, the Lord’s one work of universal (catholic) salvation in the life, death, resurrection and ascension of Jesus Christ means that the whole papal system of rosaries, pilgrimages, indulgences can not save one. Christ alone has, by grace alone known by Scripture alone in the life of His Church. Even the Law of God can not save (see Galatians 2:19, Galatians 2:21, Ephesians 2:6-8 ).